Princess apron is the most elegant and fancy style apron. These modern hair salon aprons are princess inspired salon tunics. 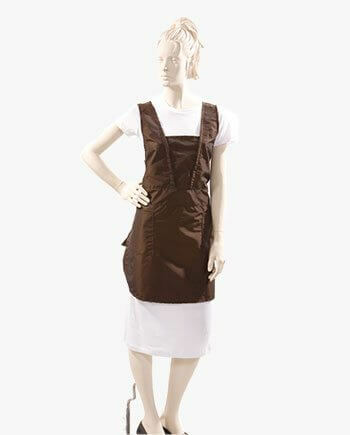 Salonwear’s multi-purpose salon aprons are designed for the busy professional stylist who uses a variety of tools. Aprons are excellent piece of salon apparel that can be used as hairdresser apron, hair cutting apron, cosmetology apron, nail apron, spa apron, leopard print apron, hair stylist apron, custom apron, embroidered apron, coloring apron, bleaching apron, comb-out apron, shampooing apron and many more aprons designed for a specific functionality and needs such as bib apron, ruffle apron, V neck apron, bombshell apron, sweetheart apron and printed apron. What makes these Beauty Salon Princess Aprons different from other Apron? These beauty salon princess aprons are princess inspired aprons to make you feel like a princess while you are busy styling your clients. Also, these decorative aprons are made with silkara iridescent fabric which is a brilliant fabric having perfect shimmering glow along with being chemical, bleach, and other stain resistant. These cute hairdresser aprons are designed especially in an over the shoulder style, to avoid strain on the neck. Combination of 55% Polyester and 45% Nylon fabric is used on these stylist aprons so that hair will not stick to it. Discover the perfect flawless aprons for women in traditional black or brown colors. It has adoring front and back piece with side ties for an adjustable body fit and two front pockets to carry clips, combs and other salon & spa accessories. Aprons with pockets allow for easy storage and access to your most frequently used tools. Embroidered logo and screen printed logo on your princess apron will give the final punch to your salon wear and also a professional impression to your salon. Salonwear.com also deliver aprons in bulk for volume orders. Custom aprons are manufactured in Salonwear’s factory in the USA.